Sometimes people can be difficult. I am confident that my wife would agree that I can be difficult sometimes as well. This is no different from patients. We may know the slam dunk treatment or the grand slam workup, but if the patient is not on the same page with you, the provider, they are the final judge who says if they are okay with doing what you are presenting and suggesting. I met a patient early on in my education who was an older female that presented as a new patient. She had a litany of chronic medical conditions, type 2 diabetes, hypertension, GERD, hyperlipidemia, and a recent ischemic stroke. She was on baby aspirin, atorvastatin, losartan, metoprolol succinate, metformin, Lantus, Humalog, Spiriva, and albuterol. Along with addressing these issues, the patient noted that she had been having problems with hoarseness that was present before the stroke. In addition to the chronic medical conditions that the patient had she was also a heavy smoker that was still smoking one pack per day. Initially, we treated patient with ranitidine and Flonase treating suspected GERD or allergic rhinitis with posterior nasal drip contributing to her symptoms seen on examination. After one month of therapy, her symptoms had not improved and had actually worsened. It was thought that perhaps the hoarseness was due to her recent stroke, but she had been established with speech-language pathology who did not believe that this was the etiology of her hoarseness. We advance to PPI therapy along with nasal ipratropium at that juncture to see if these helped with her GERD and post nasal drop. The PND improved, and she had no GERD symptoms on the PPI therapy, but the hoarseness was still persistent. At that time due to patient’s persistent nicotine dependence with smoking, we advanced to imaging of the head and neck with a CT scan to rule out any mass that could be contributing, as well as a referral to ENT for further evaluation and treatment. The patient was okay with doing the CT scan but did not want to go to ENT. They noted that they did not have great means for transportation and could not get to the appointment. We offered public transportation to the nearby town, we offered gas cards, but still, she would no show these appointments. The CT scan ended up being non-concerning for any head or neck mass. At each visit that the patient was seen in the clinic, we tried to get her to go to the ENT appointment, until one day she finally went. When there, the ENT performed direct visualization with a laryngoscopy which found a sizeable vocal cord mass. The patient returned for surgery a few weeks later, and thankfully the mass returned as a benign vocal cord polyp. As you all can see, this patient was quite persistent for months, regarding going to the specialist. Sometimes this can be due to a valid reason, and in others, it can be due to the patient just not wanting to do what you ask and think that they may know what is best for them. Regardless, you can only lead a horse to water; you can’t force them to drink. Today we will be going through the evaluation of hoarseness in adults. The prevalence of the concern of hoarseness in adults is around 30 percent. Most of these cases go without being seen by a healthcare provider and resolve on their own without medical intervention. 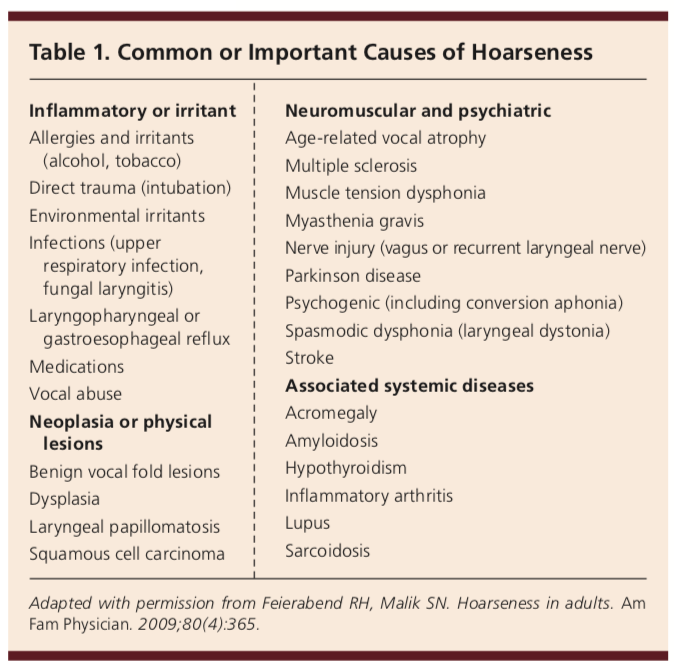 Hoarseness can occur due to a multitude of reasons, including systemic disease, irritant or inflammatory etiologies, neuromuscular/psychiatric, or neoplasm. Am Fam Physician. 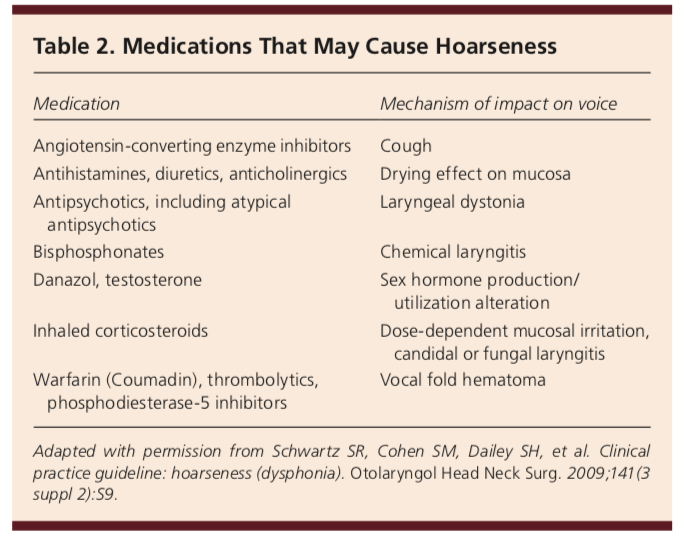 Hoarseness in Adults. 2017;96(11):720-728. Copyright © 2017 American Academy of Family Physicians. The most common cause of hoarseness overall is in the inflammatory group, this being laryngitis. Acute laryngitis is usually a self-limiting condition lasting 3 to 4 weeks, often caused by the strain of the vocal cords, an upper respiratory infection, or posterior nasal drip associated with allergic rhinitis. Chronic laryngitis is when symptoms persist for over four weeks duration. Some common etiologies in this instance include inhalant injury, most commonly smoking, GERD or laryngopharyngeal reflux, postnasal drip, or persistent voice strain. Additionally, medications can be a cause of chronic hoarseness. Some of these include ACE inhibitors, bisphosphonates, inhaled corticosteroids, diuretics, and many more as listed below. Another cause of hoarseness can be benign or malignant lesions. 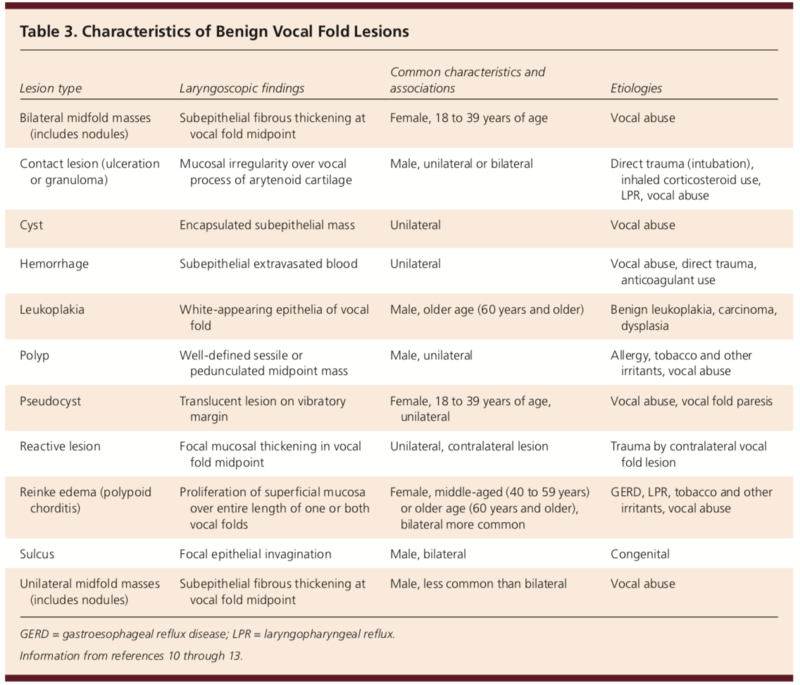 Common lesions include Reinke edema (polypoid chorditis), pseudocysts, cysts, nodules, or polyps, all of which are most commonly benign findings seen on laryngoscopy. Masses that are malignant include laryngeal leukoplakia, squamous cell carcinoma, and dysplasia. Risk factors for malignancy include smoking, chronic laryngopharyngeal reflux, GERD, and alcohol abuse. Hoarseness along with other symptoms including dysphagia, otalgia, unilateral pain, hemoptysis, or odynophagia may be the initial presentation in a patient with malignant lesions. 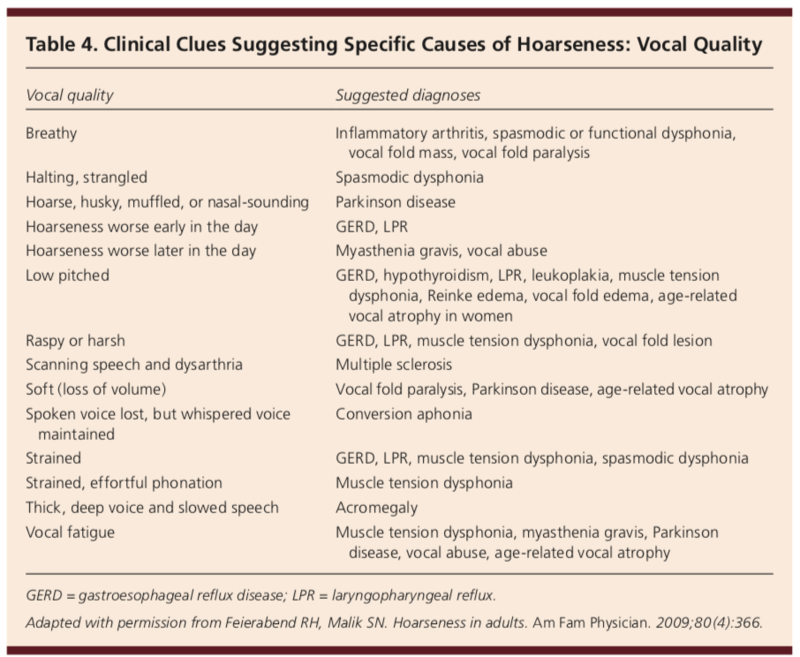 Vocal cord paralysis is often a neurologic etiology of hoarseness. One-sided paralysis often is caused by recurrent laryngeal nerve impairment during neck, cardiothoracic, or thyroid surgery, but also the cause can be unknown. In addition to iatrogenic etiologies of unilateral paralysis, carcinoma of the neck or thyroid and apical lung cancers can be the underlying issue in some cases. Bilateral vocal cord paralysis can be seen in a bilateral surgical procedure on the neck or thyroid gland due to bilateral recurrent laryngeal nerve injury. Some other causes of bilateral paralysis include prolonged endotracheal intubation, age-related atrophy, and neurologic conditions such as Parkinson disease, myasthenia gravis, multiple sclerosis, or amyotrophic lateral sclerosis. Spasmodic dysphonia is an episodic uncontrolled contraction of the laryngeal muscles which creates a strangled voice. This was once considered psychogenic in nature, due to the vocal changes occurring in response to stress. Some systemic diseases have been known to manifest with hoarseness. These include lupus, autoimmune arthritis, hypothyroidism, acromegaly, laryngeal amyloidosis, and sarcoidosis. The first step in evaluating the complaint of hoarseness is to characterize the quality of speech, speech effort, change in voice, and if there is any pain present.1 Additionally as mentioned above it is essential to gauge for any other associated symptoms such as reflux, globus sensation, throat clearing, postnasal drainage, or burning in the throat. Also, take a full medication reconciliation. Voice use and occupation should be noted to see if there is any risk of voice overuse, example being a vocalist, coach, teacher, or umpire. Acute onset of symptoms is more consistent with inflammation, injury, infection, or vocal abuse. Chronic or progressive symptoms are more often related to more significant illness. If symptoms have persisted past two weeks, then one should consider direct visualization with laryngoscopy. 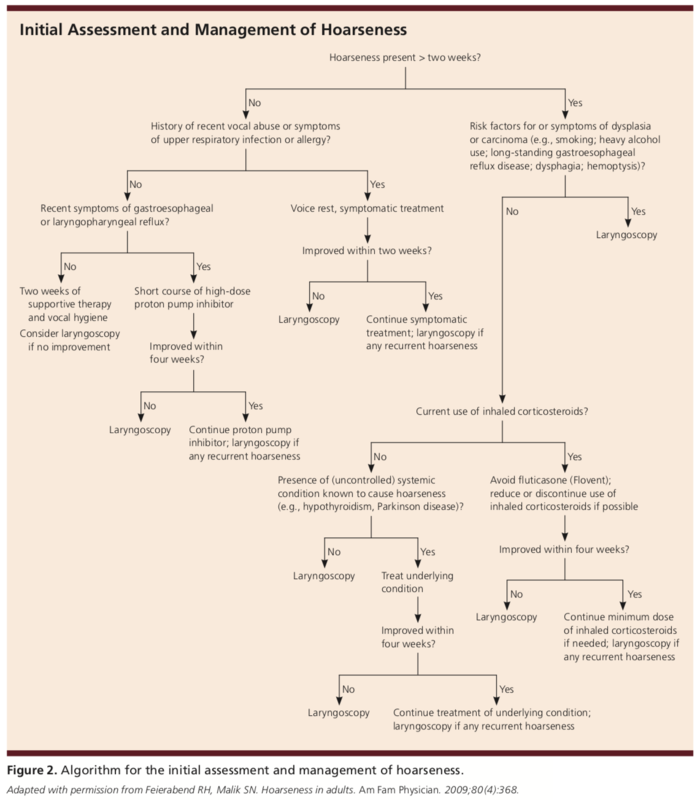 If a patient presents with hoarseness and significant risk factors or associated worrisome symptoms of malignancy, then laryngoscopy can be considered initially. Below is a list of findings on laryngoscopy with likely etiologies. 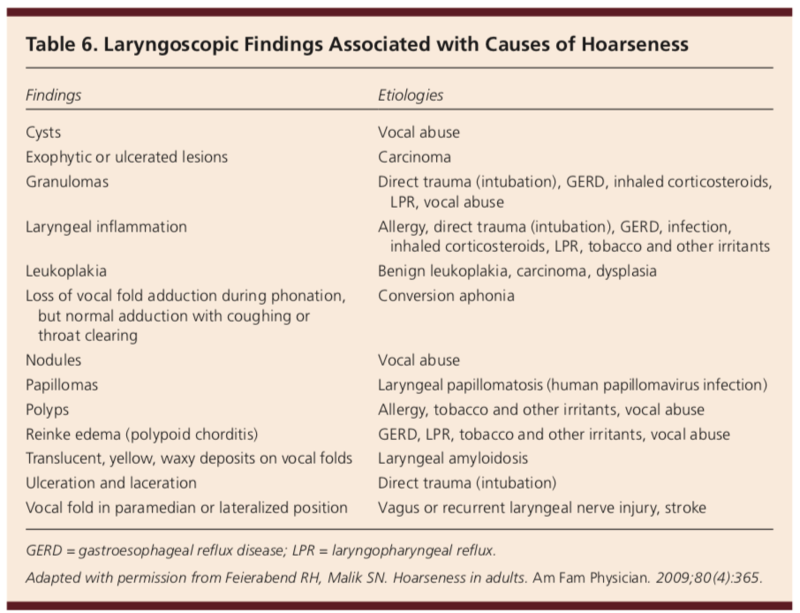 The treatment of voice hoarseness is dependent upon the underlying etiology. This may include H2RA or PPI therapy for reflux or GERD, intranasal steroids for postnasal drip, discontinuation of triggering medications, or voice therapy with a speech-language pathologist. Remember that when practicing you may think that you know exactly what you need to do to help the patient, but they may be resistant for several reasons. Always remember that you are not in the patient’s shoes, and they may think that their reasoning is best for them at that point in time. Our job is to provide the best care that we can and to do no harm. Be persistent in your care and education, but most importantly care for your patient. Patient's do not care how much you know until they know how much you care. Am Fam Physician. 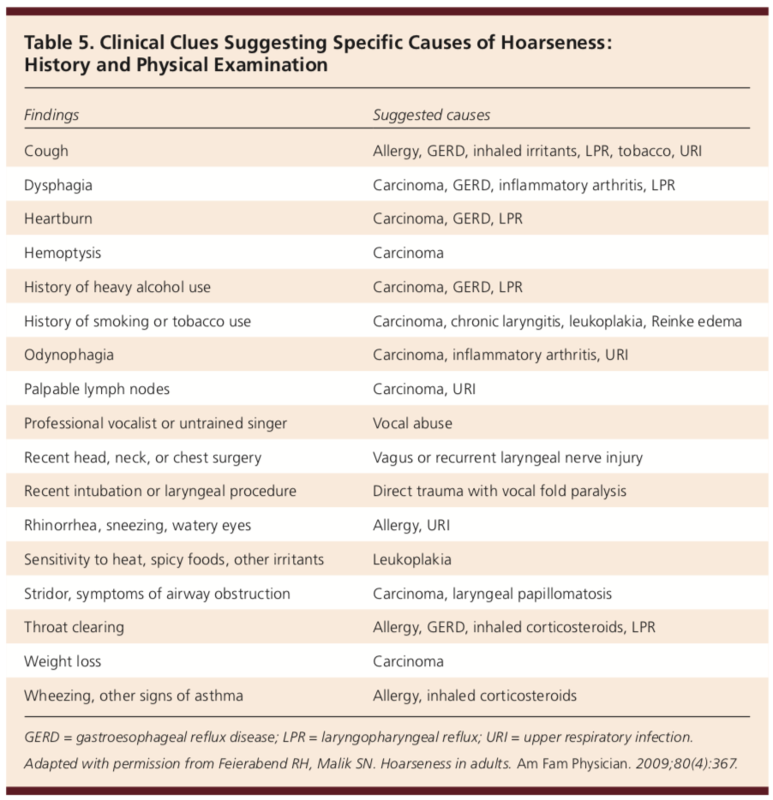 Guidelines for the Diagnosis and Management of Hoarseness. 2010, May. Copyright © 2010 American Academy of Family Physicians.